Maria’s Cafe is leaving the East Village for West Harlem | HarlemGal Inc.
Maria's Cafe is leaving the East Village for West Harlem. 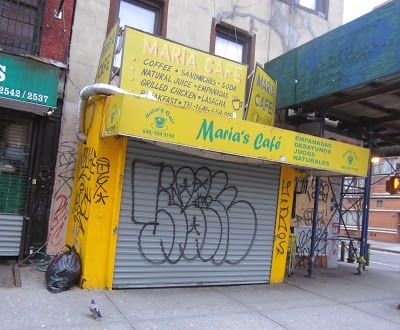 We recently heard that Maria’s Cafe was leaving her sliver of a food stand on East Third Street and Avenue C… Our source said that she would be subleasing space from a restaurant on Broadway around East 10th Street… We had it wrong. Well, the Broadway part is correct … however, it’s Broadway and 131st Street in West Harlem. Plans were filed with the city in July 2005 for a new 6-floor residential building here … The city disapproved the plans in May 2006, and nothing more happened with the project. This entry was posted in drinks, food, Harlem, Harlem bloggers, Harlem blogs, Harlem restaurants, HarlemGal, restaurants and tagged Harlem, Maria's Cafe. Bookmark the permalink.